My wonderful girlfriend was out of town, and the weather looked decent, so what could I do? Go hiking again. I would have done the same with her here (and gone together with her), but just because she’s not here doesn’t mean I can’t go, right? I hiked to Camp Muir again. I was craving the thin air at 10,000 feet. The forecast called for freezing temperatures, pretty strong winds and a 30% chance of snow flurries at 11 AM or later, so I left home quite early, around 5:30 AM and had my boots on the trail a little after 8 AM. At first, I was perhaps a bit slower than a few weeks ago, but I was at Pebble Creek at 9:15 AM. I made it to Camp Muir just before noon. I was wearing my new mountaineering boots for only the second time, and the first time, when I hiked up Mt. Si in them, they tore up my ankles. This time, I put a large waterproof bandage on my ankles, then a large patch of moleskin, and I taped all that together with medical tape around the heel and ankle. I also wore a thinner sock as liner and a thicker sock for insulation and cushioning. It worked — my blisters didn’t get worse. Wearing the mountaineering boots allowed me to use my crampons. 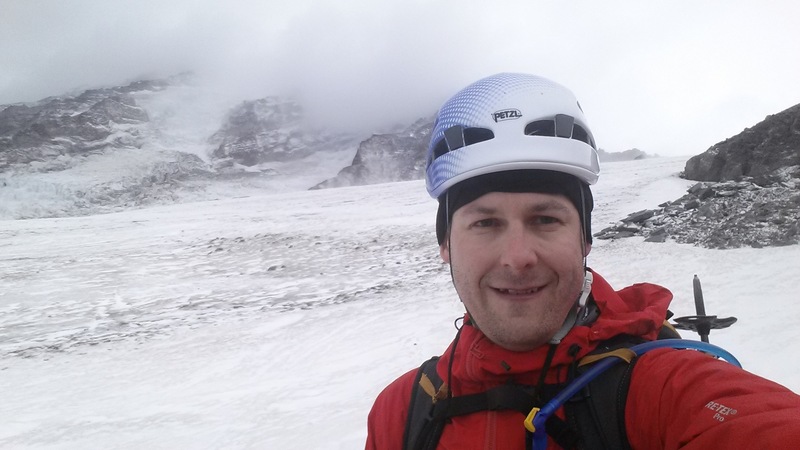 Wow, it was so much easier to get up the snow field in crampons. But on the other hand, it was also below freezing, and the snow field wasn’t melting anymore. All crevasses that I tested had frozen over and were solid. So maybe it would have been about as easy just with my regular hiking boots and without crampons as well. I was somewhere around 9000 ft at 11 AM, and the winds had really picked up for the last half hour. At times, it was close to a white-out. I told myself I’d go to 9000 ft and then descend, but when I was there and ready to turn around, the weather improved markedly. I decided to continue another 1000 feet to Camp Muir. Up there, it was really cold and windy this time. I took my glove off to take some pictures, and I had planned to check my blood oxygen saturation using a pulse oximeter, but it was too cold to continue to keep my glove off. I shoved a protein bar in my mouth and started the descent. On the way down, maybe to around 9500 ft, the weather was pretty bad. Near white-out again. But fortunately, I had a pretty good idea of where I needed to go, even without a map (I had given my paper map to another hiker who didn’t have one, and it was too cold to take my phone out). After that, the weather improved again and it was an easy way down the snow field. When I got to the rocky part around 8000 ft, though, my heels started hurting quite badly. I don’t know if it’s the fat cushion or maybe the plantar fascia, or if maybe I had laced my boots too tight to avoid the heel slippage that had given me the bad blisters before. But my descent on the loose rocks was painful and slow. It got a bit better once I was past Pebble Creek again, but I wasn’t the fastest by any means. I was down at the car at 3 PM. And when I was walking around with my backpack, helmet, ice axe, mountaineering boots, puffy, and gloves, being only the second person coming down from Camp Muir that day, I felt like a baller around the hoohas at the visitor center. Windy, with snow flurries, on the way up to Camp Muir. At Camp Muir in below freezing weather. The wind was blistering cold. 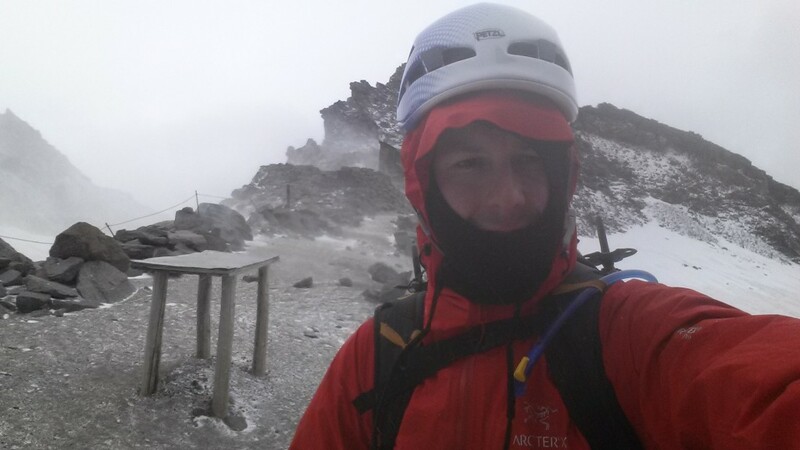 I know, the hood goes over the helmet, but it was too cold to adjust it at 9000 ft.
Getting to Camp Muir when it freezes is easier than when it melts. If I tape up my ankles well, they last well over 8 miles in my La Sportiva Batura 2.0 GTX mountaineering boots. But after some time, the bottom of my heels start to hurt. Mountaineering boots and crampons on snow or ice: wonderful. Mountaineering boots and crampons on rocks: awful. Mountaineering boots on rocks: still bad. I don’t have very good balance in them. Because the soles don’t bend at all, my foot is basically flat on the surface of the rock, and my leg goes with it. Mountaineering boots are a lot rougher on my knee when on rocks. Because of the stiff sole, I can’t really ensure that I don’t pronate or roll my knee inward. If a rock I step on is lower in my middle and higher on the outside, my knee will rotate inward. This is bad and worrisome. Should I put Superfeet Green insoles in my mountaineering boots? Those are the insoles I use to work against pronation in a lot of my other shoes. Or maybe Superfeet RedHot? Seems similar to the Green. Even when I’m wearing gloves, I need to tape up my middle finger to avoid getting blisters from the ice axe. It definitely helps to chug 1.5 liters of water when still at the car. No dehydration this time. I also had a Nalgene bottle with me, and that was good, because there were brief moments when my Camelbak line froze. I’ve had that happen before, but it still always surprises me. I like the Premier Protein bars, especially the dark chocolate mint one, but they freeze close to solid. I know, I should stick them in an interior chest pocket. But they last a long time for me. Today, I had two bars during 7 hours of hiking, and that was enough to get me from 5 AM breakfast to 5 PM, when I had a nut bar in the car. During two days in the Enchantments, I had two servings of freeze-dried lasagna and four or five bars. For freezing temperatures, I need thicker gloves than the rappelling gloves. I should set up my hard shell’s hood to the correct helmet size before I absolutely need it. But I really like a lot of the equipment that I have: the Arcteryx Alpha FL jacket is probably the best jacket I’ve ever had. Wind-resistant and breathable. A joy to be in. The cheap Paradox merino blend base layer that I picked up at Costco works really well. Keeps me warm and dry. I already noticed that in the Enchantments. I need to somehow tuck in my pant legs when I’m wearing crampons. Otherwise, I step on my pants with the crampon spikes. How? No idea. How do I tuck them in with the Batura’s supergaiters? With regular gaiters, this wouldn’t be a problem. Ah, apparently you make sure the crampon straps go over the pants. I don’t like skiers in the national park. Now I’m soaking in the tub with a big bowl of chicken soup, fortified with black beans and lots of hot sauce.